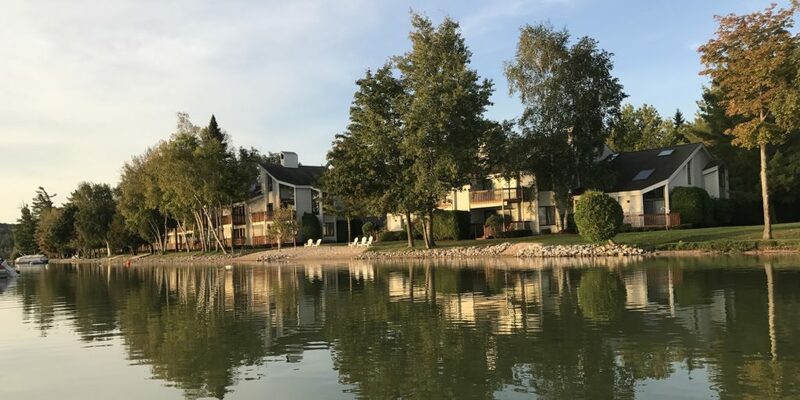 Lakeside Club is a condominium community of seventy-six units nestled among mature trees on the sandy shore of Round Lake, midway between Petoskey and Harbor Springs. We’re next to the Round Lake Preserve with its scenic hiking trails and lake-viewing platform, just down the road from Petoskey State Park, and across the road from a walking/cycling trail that extends from Charlevoix to Mackinaw City, Harbor Springs, and Alanson. Residents and their guests can swim, sunbathe, or take their boats or paddleboards around beautiful Round Lake. We can also enjoy a swim in an indoor heated pool, play tennis or pickleball on our outdoor courts, relax with friends in the gazebo, or work out with exercise equipment in the clubhouse. The individual units are located on two private roadways—Lakeside Drive North and Lakeside Drive South. Both can be accessed from two entrances off M-119. The individual units occupy from one to three floors and vary greatly in design and furnishings. Most units have oversized single car garages that can accommodate sporting equipment and do-it-yourself workshops. Watercraft are moored offshore on Round Lake, while boats and trailers are stored in the association’s on-site boat lot. Lakeside Club is unique in this area for being right in the middle of things! Right next door is a shopping plaza featuring Toski Sands—a popular gourmet food shop, meat market, deli, and party store—and Crooked Tree Breadworks, which bakes exceptional breads and pastries. Driving a minute or two north on M-119 takes you to Petoskey State Park, which features walking and ski trails and over a mile of sandy beaches on Lake Michigan’s Little Traverse Bay. Three minutes north is the headquarters of the Little Traverse Conservancy, which operates more than 200 public nature preserves in Northern Michigan—many with woodland trail systems and water frontage, including three on Round Lake. Drive four minutes south and you’ll find the “Ultimate Trailhead” of the Top of Michigan Trail Council, which oversees about 300 miles of cycling/walking trails. Skiing and recreational resorts, Boyne Highlands and Nub’s Nob, are twelve minutes away. Twenty minutes on M-119 takes you to the scenic “Tunnel of Trees” drive that ends at historic Cross Village. Farther north are Wilderness State Park, miles of Lake Michigan Beaches, and a network of backcountry roads that you can spend years exploring. And golfers can have their pick of some twenty nearby golf courses, including several created by renowned golf course designer Arthur Hills. A number of thriving towns and charming villages with fine restaurants, unique shops and galleries, and music/performance venues are within easy driving distance from Lakeside Club. Mackinaw City is near Wilderness Park and Headlands International Dark Sky Park, provides ferries to car-free Mackinac Island and is a travel destination in its own right. Harbor Springs is known for its historic summer resorts such as Wequetonsing, its art galleries, and its many artesian springs. Petoskey is famous as a source of Petoskey stones, and its Gaslight District is filled with independent shops, boutiques, and galleries. Bay Harbor is a planned luxury resort community with boutiques, fine restaurants, and a Marriott Autograph Hotel. Walloon Lake, on the shore of a beautiful lake of the same name, is the site of many vacation homes including Windermere, the childhood summer home of Ernest Hemingway. Boyne City is well-known for its spring Morel Festival and its proximity to Boyne Mountain Resort, and has a thriving farmer’s market as well as creative food and wine shops. Charlevoix, on the opposite end of Lake Charlevoix from Boyne City, is known for having the best natural harbor on Lake Michigan, for its Venetian festival that features an after-dark lighted boat parade, and for a ferry that travels 30 miles on Lake Michigan to Beaver Island—America’s Emerald Isle and only former kingdom! Some residents make Lakeside Club their full-time home while others enjoy their get-away spots in this nature-blessed area. Lakeside is pet friendly for owners (two pets maximum) but renters must leave their furry friends at home. Residents take pride in the buildings and grounds, supporting landscaping and maintenance projects that provide an uncommonly beautiful and tranquil environment. With its exceptional location and excellent amenities, Lakeside Club is the ideal place for living the good life! Here’s what some of the owners have said about Lakeside Club. Coming from the Detroit area, we began visiting the Harbor Springs/Petoskey area 20 years ago. We had previously rented at various other resort areas in Michigan before finding Lakeside Club. We rented the same Lakeside unit for 2 years before deciding that Lakeside Club was the best of all worlds and purchased our current unit 13 years ago. There’s nowhere else we’d rather be! In 2013 we made the decision to move from Sault Ste. Marie, where we had retired from our positions at Lake Superior State University, to Petoskey—a place we’d visited often because of its beautiful setting, great restaurants and shops, and many cultural and outdoor opportunities. We were both tired of maintaining our home and property, so we decided to look into the condominiums available. A Google search for “Condos, Petoskey,” brought up the Lakeside Club, so we made arrangements with a realtor to view some of the units. We’d already noticed Lakeside Club’s proximity to Petoskey and Harbor Springs, and appreciated its easy access to the Round Lake Preserve’s hiking and snowshoeing trails, Petoskey State Park with its trails and long sand beach, the network of paved cycling trails that now extends from Harbor Springs to Charlevoix and from Petoskey to Mackinac City, and its location right next door to two of our favorite food stores, Toski Sands and the Crooked Tree Breadworks. Viewing Round Lake through the picture window in a lakeside unit made it an easy decision—this was the place! After nearly four years here we have no regrets—it’s the perfect location for “Living the Good Life” in Northern Michigan.